I I know those of you that have followed my adventures on this hike are looking for the "pictures". Well, here they are, well at least some. I will spend more time and share more pictures of the individual falls in additional posts. My goal was to address the hike and the beauty first. 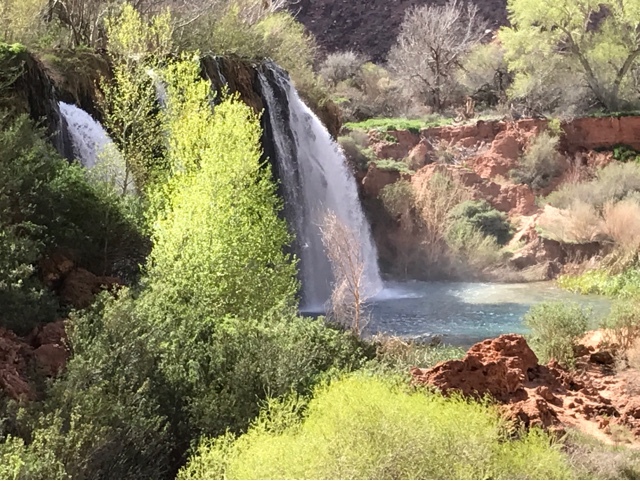 Our first day was the drive to the Havasupai Reservation. Our second day was the hike in and we did see some falls, but I wanted to take today's post to explain all the falls and show you pictures I took of each one. 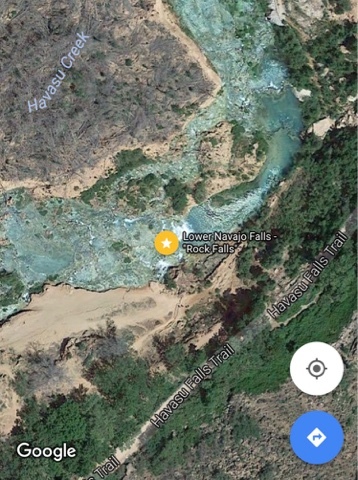 Above is the Google aerial map image for the first falls. 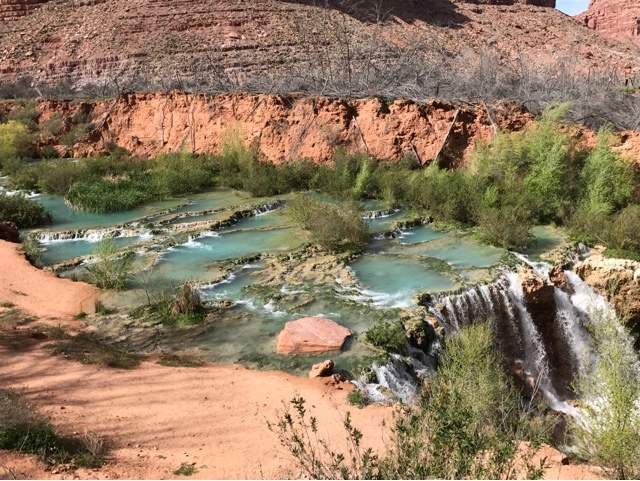 This is about a mile past the Supai Village, and the first ahhhhh moment. 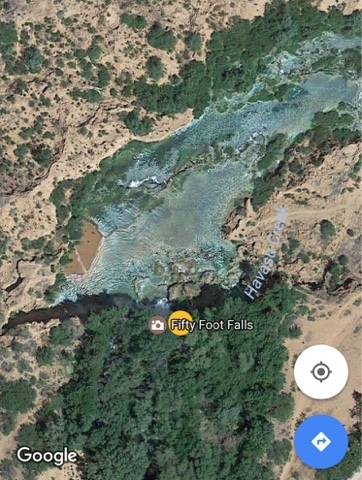 Google has it listed as the 50 ft Falls, but it's above the Lower Navajo Falls, so possibly it should be called Upper Navajo Falls. The above image was our second reward for the day. 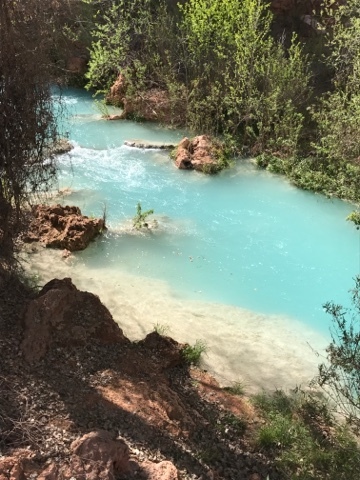 First was the light blue color of the Havasu Creek about 6 miles into the hike. This is now our first falls about 9 miles into the hike. 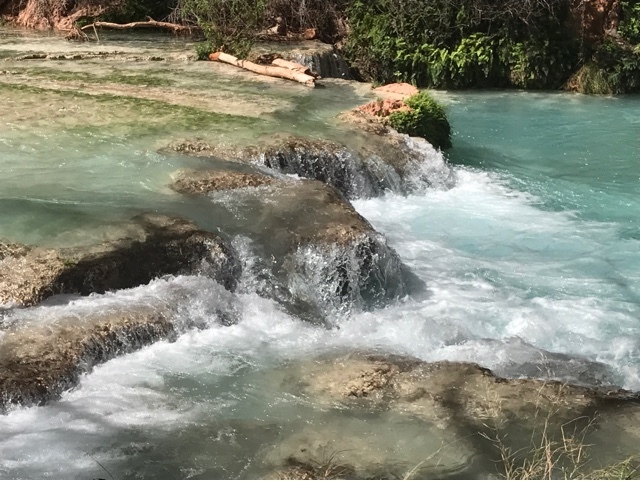 Just below the Fifty foot falls you see the effect of chemical buildup over time with deposits that collect and make small dams to create pools. This process is similar to limestone caves where stalagtites drip to form stalagmites. There literally hundreds of small falls that are created this way. 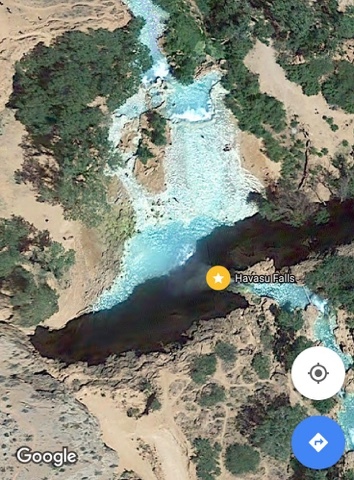 Above is Google's aerial image of the Lower Navajo Falls. 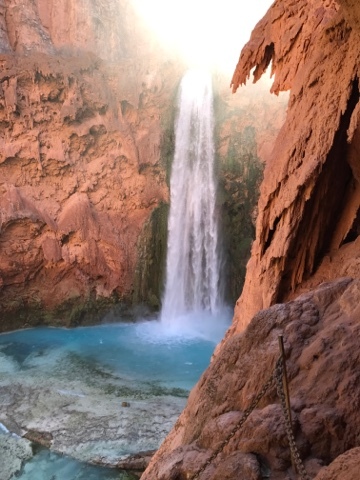 The next in the series of falls on Havasu Creek. Here is my picture of Lower Navajo Falls. Light plays heavily on the color the water takes on. Too much reflection washes out the blue. 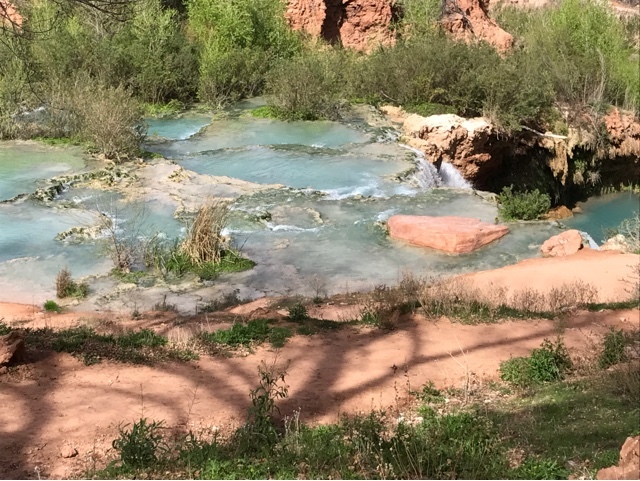 Here the sun is directly on the creek below Navajo Falls and it's a wonderful blue color. 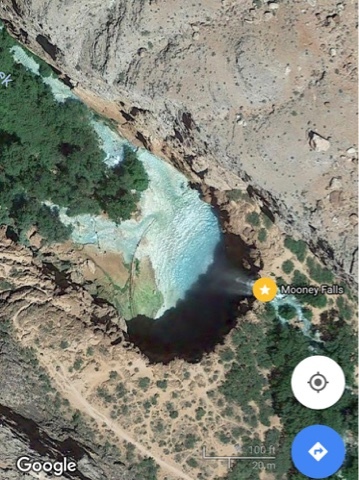 Above is Google's aerial of the famed Havasu Falls. 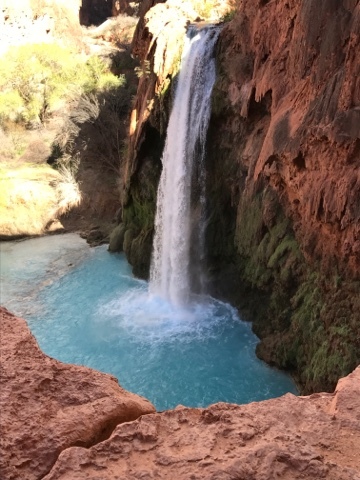 Here is our first look at Havasu Falls as we hiked past to the campground. 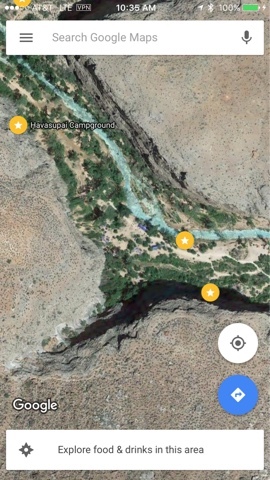 Above is Google's image of the center area of the campground. The middle gold star is our campsite. The lower right star is the spring for drinking water. The upper left star is the campground title. There are campsites right on the water's edge, but we chose to have higher ground since we wouldn't be in our tents watching the water. 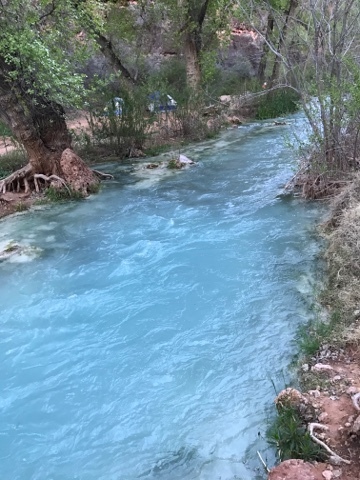 Above is the water color running past our campsite with no sun shining on it and it is a shade darker blue. The next is Mooney Falls and it is the highest of all the falls. Above is Google's aerial of the falls. I took this picture from the bottom of the falls after an arduous climb down that I will discuss in a future post. Below Mooney Falls is the trail to Beaver Falls that is a long way away from Mooney and our late start didn't provide enough time for us to go to this falls and then back to the campsite. Above is the kind of falls all along the way to Beaver Falls formed by mineral deposits. Beaver Falls is this way but bigger. 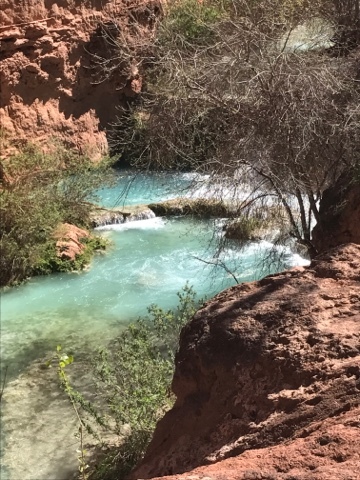 Falls after falls as you climb towards Beaver Falls and further on the intersection of Havasu Creek and the Colorado River. Above is Google's aerial of Beaver Falls. 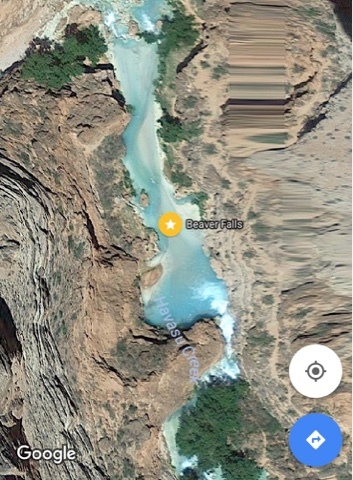 Here is Google's view of the intersection of Blue Havasu Creek and the Colorado River. 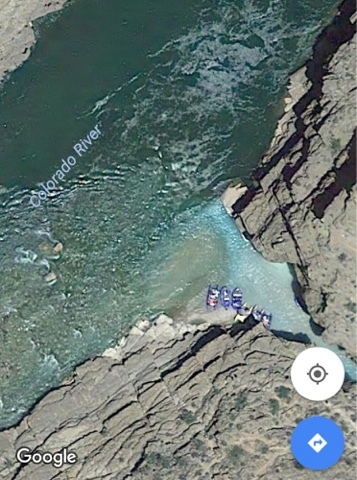 This location is popular as a stop for Colorado rafting. 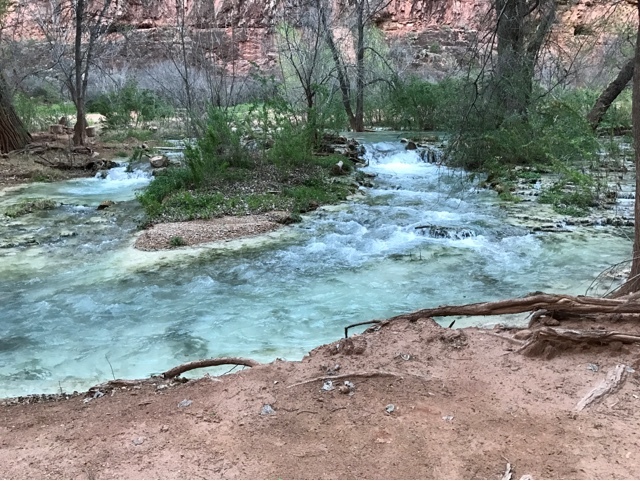 I have read that Havasu Creek is the second largest tributary into the Colorado in this area. 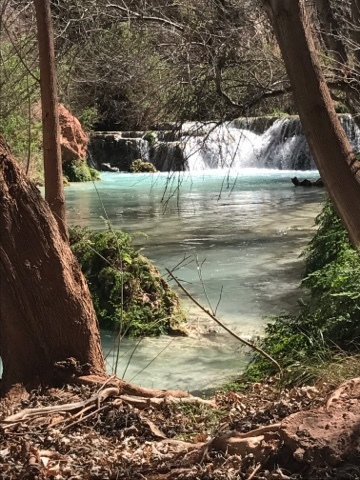 So, there you have a tour of the falls along the Havasu Creek. As I mentioned before, I will be covering some of the falls in more details and of course pictures. Thank you. I am so very happy to have gotten to go and share it. It is so beautiful and I have wonderful memories.